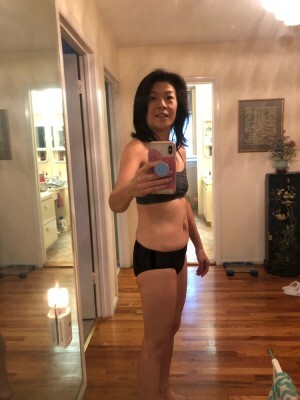 Catherine H.'s Kenzai Chisel program, Chisel | Apr 22 2019, starts in 2 days. There are many things I am grateful for. I am grateful for this program and the wonderful support I (and all my teammates) received from the Kenzai staff. This program has shown me that it is never too late to reclaim your body. At 52, and beginning to hit menopause, I thought I would never shed those ever increasing lbs of insulation. Ward and Tayla thank you for cheering us on in meaningful ways. I am grateful for Team Pegasus. Going through hardship together is a bonding experience. I enjoyed hearing their journey and sharing mine. Initially, I didn’t think I would blog so much but in the end, I enjoyed connecting with my teammates. I am grateful that I am healthy and well enough to still exercise. I, and many others I know, have negative thoughts of what is possible. We limit ourselves and create many excuses to keep ourselves stuck. Through this program, I am hoping to permanently throw that mindset away. I have not worn a bikini since 2000. This summer I plan to! Whatever excess I have on my belly, I am going to wear it proud. I have to also thank my family for giving me the space and time to work on myself. Just curious as to what others are doing next. If you feel comfortable, please share. I do plan to buy a membership and am torn between sculpt and chisel. Need a shorter program. Really enjoyed our time together and don't want to lose touch. You guys were the best, so supportive, encouraging and funny. Best of luck in whatever comes next. Big Hug! 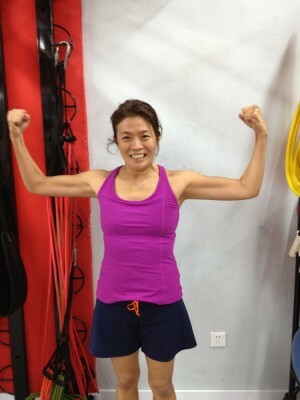 This was me in Spring 2012 after training with a trainer and eating paleo under the guidance of a nutritionist. Am so happy to be almost there again and really hope/ plan to maintain it. Thank you Kenzai and all my fellow trainees. Food wise this week was fine, am trying to experiment with eating out (a bit more) and using a little bit of salt in my cooking from time to time. Apparently, I was not using any added salt and Vicki pointed out this was not a no-salt diet. I guess I am prepping for life after Kenzai. Exercise was good, was able to do 5 out of 7 workouts (which is fine with me). The reason I said one more week is because next Saturday I am traveling to Boston and New York. I am not sure how I am going to resist New York pizza, wine, and some other tasty treats while catching up with old friends. Wish we were on our last week so I can say that I finished strong. As I am laying on the ground doing my side sit ups and wondering when the hell this exercise will be over, I realized that all I do is eat and exercise (and run a few errands). On a typical day, I eat breakfast, run an errand, have a snack, do 40 mins of cardio, have lunch, do another chore, eat my 2nd snack while driving to pick up my son, bring him to an activity, make dinner and then do the other exercises and have my last snack. I guess the monotony didn't really get to me before but now I am dreaming of a time where my whole life is not focused on eating and exercise. These super sets are killing me, they seem to take such a long time. That being said, I am really happy with the results. Went out to lunch today with some girlfriends intending to be good. Instead, I was good at finishing everything in my bowl! Good grief! Usually, I feel really good after I eat when I am compliant, but now my body is dragging, bloated and I have a headache. When will I learn?! Oh well, today will be a rest/ indulgence day. Help! Really need to add variety to my food. In order to keep my life simple I have been eating basically the same thing everyday, rice, ground turkey and steamed vegetables with vinegar. My palate is screaming for something else. I also find that I am full quicker at lunch (or bored and thus can't finish everything) and then hungry quicker. Need to make time to make my food more interesting. Besides Kip's butternut squash ragu, can anyone share other veggie recipes they have been enjoying. And we'll keep on fighting to the end... Just saw Bohemian Rhapsody and Rami Malek definitely deserved the Oscar for best actor. What an incredible journey Freddie Mercury had. Now I am listening to Queen's greatest hits (as well as other music) to get pumped when things get monotonous. Also got the chance to see Hamilton this week, what an AMAZING musical, so creative and funny (I know I live under a rock). Actually, I don't mind the diet, am use to it. The exercise is fine, however, I find that after two days of a hard workout, the third day, I need to do something less intense (i.e. emergency workout or yoga). What is hardest for me and I think I said this earlier, is when my husband is out of town and I have a lot of food prep to do. Making separate food for me and my family exhausts me, in addition to driving my son to his activities, working out and other commitments. BTW, We Got This! We are all Champions! Stay Positive! What started with good intentions ended up with many indulgences. Spent the week skiing and was able to be compliant with breakfast and lunch. But then came the social dinners and boy were they good!!!. Am happy we have 42 days left. Plan to hunker down when we arrive home and hope I did not do too much damage. I am not sure how others mange to be on Kenzai body and be social at the same time. On a separate note, my tummy did not react well to all the rich food from last night and today I am so sluggish. There were other negative side effects that I will not mention. Happy to be recommitted. Today's article was also prefect in it's timing. Today has just been such a good day, I thought I would share. We are traveling to Park City Utah today. At the airport, we were offered 1500 USD per person to travel later today. With the three of us, that was an instant $4500! We live close to the airport, so we came home and I was able to do the workout! I am beginning to see a difference in my body. Am so happy to see the fat come off my back, something that I was trying to get rid of for a while now. I encourage you all the look at your pictures and compare from week 1. Thank you all for your support and your blogs. Hearing your accomplishments and struggles has been really helpful. Good Morning! I wish I can say I am writing to you from sunny California but in fact it has been raining for weeks and I feel this is what it must feel like to live in Seattle. 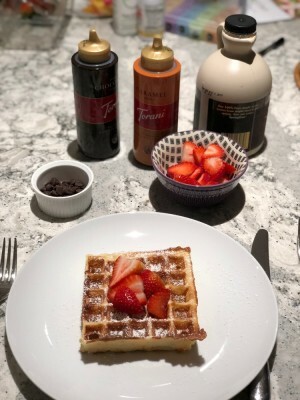 Made my family a special V-day breakfast of belgium waffles with all the trimming. I indulged myself in using a waffle as a carb for breakfast. My son, knowing how I love chocolate and have not had any in a long time, insisted I take a bite with a chocolate chip on top. Of course I had to do it. For the most part, I have nothing really new or interesting to report. I am pretty good with the diet because I am basically choosing to stay home and eat. My husband has asked me if I plan to eat like this forever. I tell him, I don't know but I will probably try to eat clean in general. Bought Gwyneth Paltrow's The Clean Plate, to see what the future may hold. I am hoping to help my family eat more clean in the future as well. I find it draining to make meals for myself and then something separate for them. (At one point, I realized I was standing at the kitchen counter for hours, cleaning, prepping cooking, weighing ...) No room for creativity. With regards to exercise, I am pretty compliant as well but finding it harder to get motivated sometimes. Since I am not jumping rope, I have to find time to go to the gym. Recently realized that I don't really sweat on the bicycle or the elliptical despite using quite a bit of energy. Have turned to cardio videos and cardio classes at the gym. Hoping they will make a difference. Have also started taking supplements to support my adrenal glands. Have a history of depleting my cortisol levels and feeling exhausted. On a separate note, I have discovered the beauty of getting manipulated by a chiropractor. Have been living with discomfort in my glut for over a year. It's amazing what we can get use to. Must listen to: Becoming by Michelle Obama. It's a great book and it is narrated by her which adds to the feeling of the book. So today is my birthday and as I mentioned on someone else's blog, I became a bit obsessive over what would be the perfect indulgence. So here it is, a sushi lunch at a Japanese restaurant. Followed by a small scoop of my favorite ice cream (coconut almond chocolate) later that day. In all honesty, I probably could of done without the sushi lunch. Although it was good and I love sushi, it did not bring me the joy it usually does, instead I got a headache later (not sure why, the salt, too much green tea? who knows?) The small scoop of ice cream on the other hand brought me lots of JOY. Every bite was savored. They say that sugar stimulates the part of the brain that relates to pleasure. Boy, was that good! Now you know my Achilles heel. I really don't think that the number of minutes for the alternatives to jump roping changes. It has been the same from the beginning. -there are days where I struggle to get the workout in but push myself to do so. -get bored with my food and then discover something delicious. This week I am discovering what my steam oven can do. Last week, I discovered how delicious a splash of apple cider vinegar can be. I am happy to report that I have lost the weight I gained over the holidays and am at the weight where I find my body has a hard time going lower. Can see some changes happening. Will keep going and see what happens. Fellow trainees, please know that although I am not commenting on your post, I am rooting for you!